David Treadwell was an excellent kicker for the Clemson Tigers. Amazingly he started as a walk-on with an academic scholarship, who had only played soccer during High School. He began his college career in 1984, as a backup to All-American kicker Donald Igwebuike, then took over full-time from 1985 to 1987. Dave made 47-of-66 field-goal attempts over his playing career, including 18 of 22 in ’87 when he was an All-American. 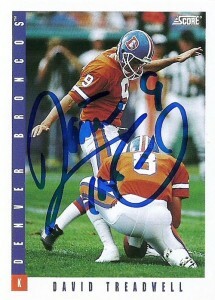 The second time would end up being a charm for David, who had been in the Broncos 1988 training camp. Released before the season, he signed with Phoenix, which traded him back to Denver for a draft choice before the 1989 training camp. That season David was named to the All-Rookie team and the Pro Bowl that season, finishing with 120 points. His 27 field goals that year, tied a 27 year old team record. He played with the Denver Broncos through the 1992 season posting well above 70% field goal completion while he played for the franchise. After the season he’d following head coach Dan Reeves with other loyalists to the New York Giants, and continue his solid kicking duties through the 1994 season. (Denver in the meantime found Jason Elam.) While he was dead on from short and medium range, Treadwell was not utilized from long range, nor on kickoffs. Rather the Giants carried an extra kicker (Brad Daluiso) for those capacities. This probably partially contributed to Dave being cut after the season by the Giants as a Salary Cap casualty. True to form, a closer look at his career stats reveals only 2 FGs attempted over 50 yards. Treadwell was immortalized on the Broncos roster of Tecmo Super Bowl. He is retired in the Denver area, and is a real estate lawyer, sports agent, and sports radio personality.